I have 2 anniversary's coming up. I escorted 2 Marines home that were killed in Iraq. SSgt David G. Ries was killed on 8 Nov 2004 and Cpl Shane E. Kielion was killed on 15 Nov 2004. I have never been the same since the day I carried them home from Dover and presented them to their familes and children. 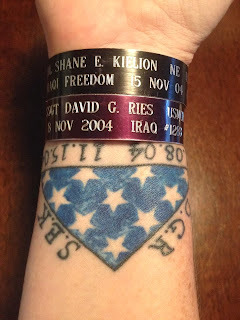 I got a tattoo last year on my wrist and always wear my Memorial Bracelets. Every time I put my arm out or hake someone's hand it is an opportunity to tell people about them. Never forget!